1 Have you ever heard of Lyme disease? Did you ever wonder why your parents are concerned about something with such a silly name? 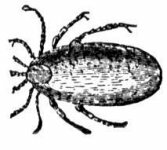 2 Lyme disease is an infection caused by bacteria carried by some ticks. Where did that funny sounding name come from? It is named after the place it was first discovered - Old Lyme, Connecticut. 3 What are ticks and why would something they carry bother us? Ticks are tiny, eight-legged arthropods. They may be as small as the head of a pin. Usually, ticks feed on animals such as mice, dogs, or horses. However, certain deer ticks and western black-legged ticks occasionally latch onto people.